In September 2014 streams of people flowed into Kenya’s largest stadium, located a few miles from downtown Nairobi on the much-celebrated Thika Superhighway. This arena is typically host to major sporting events and political speeches; Barack Obama recently addressed “the Kenyan people” there (White House 2015). But on this day, it was the site of a more unorthodox event. The crowds, dressed in their Sunday best, disembarked from their buses and walked toward the grounds, now peppered with new signage. The first of these gave a hint of what was to come: a large billboard identifying the destination as Safaricom Stadium Kasarani (Figure 1). 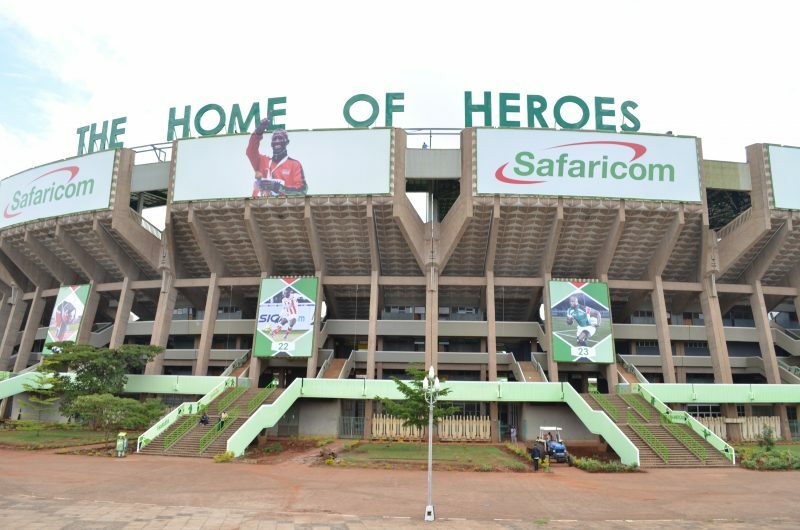 Figure 1: “The Home of Heroes”: Safaricom Stadium Kasarani in Nairobi, Kenya. The occasion was the 2014 annual shareholder meeting for Safaricom, a mobile network provider that is the country’s largest and most profitable company. Like other publicly traded corporations around the world, Safaricom stages this yearly event as an occasion to distribute information and receive feedback. It invited shareholders to celebrate their company’s successes, critique its perceived failures, and weigh in on the policies that will drive the corporation’s strategies in the year to come. But if annual shareholder meetings are a global form, Safaricom’s meeting was particularly Kenyan. On that September day, the signs of the corporate body and the signs of the body politic were brought together in a way that distilled a doubling of meaning increasingly common in Kenya, where Safaricom holds considerable cultural cachet, political import, and economic significance. Every few feet, as the national anthem played, one was confronted by Safaricom’s telltale green logo. 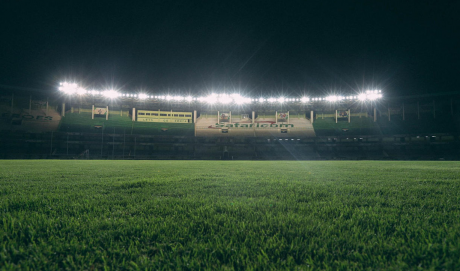 Although this marketing blankets the country—across billboards, shops, and news media—within the stadium it existed in telling cohabitation with a highly charged symbolic palette: the forest green, blood red, and dark black of the Kenyan flag. Most strikingly, the “Kenyan green” of the flag—which symbolizes the land lost to white settlers, gained through decolonization, and subsequently the source of (sometimes violent) ethnic politics—was juxtaposed against a green of a lighter hue. This shade, Kenyans will tell you, is “Safaricom green” (Figure 2). Figure 2: The Merger of Corporate and National Colors. In his influential account of the aesthetics of postcolonial power, Achille Mbembe (2001) emphasizes its banality: it is through the everyday proliferation of an autocrat’s presence—through required portraiture, inscriptions on currency, and ubiquitous media coverage—that political hierarchies are reproduced. Through the mobilization of national symbols and corporate iconography, Safaricom today is replicating such patterns of statecraft. Although the resulting formation differs in important ways from the dictatorial regimes studied by Mbembe, a close examination of Safaricom’s operations in Kenya reveals how new configurations of capital and politics shape life in Kenya today. 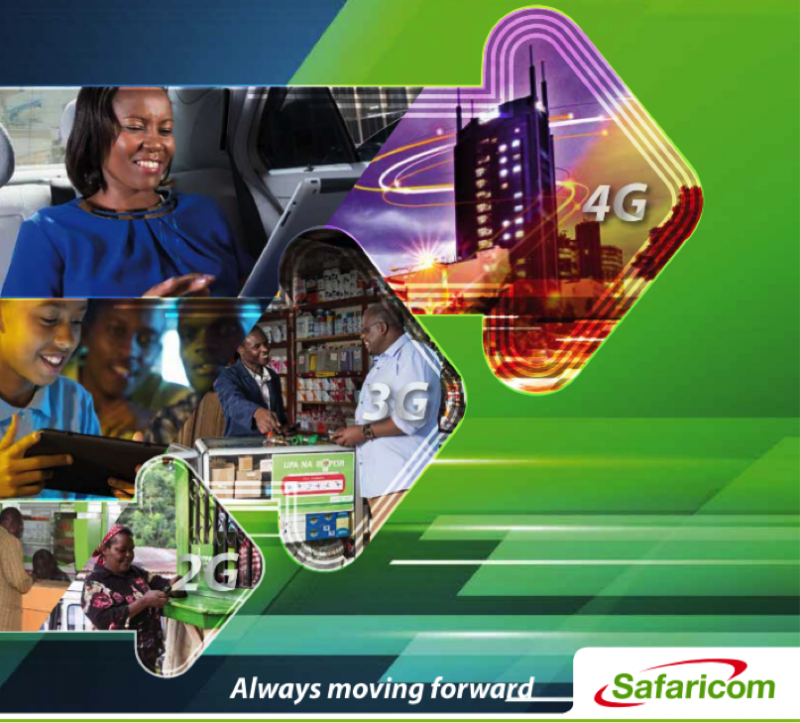 It is not only through advertisements that Safaricom impresses its symbolic order upon Kenya—though it does so considerably—it is also through the pomp and circumstance of new store openings, the sponsorship of cultural events and philanthropic initiatives, and the routine use of text messages to remind, nudge, and discipline users. Tracing the stylistics of Safaricom’s power reveals more than the aesthetic registers at play in Kenya. It demonstrates how corporations—often in close relationship with states—are able to shape the intimacies and banalities of everyday life in Kenya and elsewhere. The unwieldy entangling of this multinational corporation and the postcolonial state are refiguring notions of citizenship and bringing Safaricom into a direct, even intimate, relationship with Kenyans. Many Kenyans will tell you, with a hint of pride, that their countrymen are “peculiar,” and Safaricom invests considerably in the cultural work of fitting this distinctiveness. In doing so, Safaricom has established itself as a corporation deeply attuned to a national milieu, in large part through the calling forth of Kenyan publics as new markets. Put another way, as it extends its infrastructures to a growing body of paying customers, Safaricom invokes a seemingly noncommodified public: the nation. Consider an example. In dialogue with a wider network of development aid organizations and researchers, Safaricom invests considerably in multiple forms of market research, much of which resembles the fine-grained knowledge work associated with ethnography (see Holmes and Marcus 2006). Indeed, the company routinely attributes its success to its capacity to map vernacular practices and preferences in a bid to simultaneously create new markets and secure the “public good.” Many of its commercial innovations rely upon this acuity. For example, an oft-cited early success was Safaricom’s proactive cultivation of cash-strapped users through the introduction of per-second billing. More famously, the employees credited with designing M-Pesa initially imagined it as a microcredit repayment scheme; it was only by monitoring the unexpected behavior of the pilot populations that M-Pesa became what it is today: a person-to-person money transfer service, mimicking in digital form the already existing networks of domestic remittance (Morawcyznski 2009). Cultural expertise is thus generative of new forms of commercial infrastructure that many see as crucial to Kenya’s vibrant future as the continent’s “Silicon Savannah” (Bright and Hruby 2015). I have an issue with the contention that [these shareholder meetings] “are not social events.” This view is snobbish; what’s wrong with mixing business with interaction? Don’t managers routinely meet at leisure spots to do business while partaking of fun and food? Are ordinary shareholders lesser investors? (Ombega Mageto 2009). Here, the author was drawing on an enduring expectation in Kenya (as elsewhere) that solidarities in business or politics be marked through gift exchange. If this has been most evident historically in political rallies and electioneering, it is an idiom that readily incorporates Safaricom. These, in other words, were critiques emanating from a public conceiving itself in the registers of both shareholders and citizens. It is a common—and justifiable—fear that the privatization of infrastructure removes the capacity of citizens to make demands upon providers; the case in Kenya, however, suggests more subtle processes are at play. While Kenyans are first and foremost customers of Safaricom, more than half a million of them are also shareholders. Moreover, and because Safaricom’s corporate strategy includes national branding, sometimes these publics make their critiques not as shareholders or customers: they make their claims as Kenyan nationals, demanding the company acknowledge theirs as a relationship of reciprocal obligation and respect. While Safaricom relies on foreign capital, expertise, and infrastructure, our emphasis on the peculiarity of Safaricom belies any straightforward notion that the liberalization of markets and the privatization of infrastructure engender a deterritorialized, homogenous space of flows. Instead, the formation of capitalism visible in Kenya relies on nuanced translations and heterogenous forms of capture (Bear et al. 2015; Collier 2011). This puts the historical and cultural specificity of place at the center of Safaricom’s ability to generate profits. It also means that Safaricom reflects and responds to ideas about the social good and public interest that are both firmly embedded in Kenya and circulating globally in development thinking and corporate strategizing. One of the crucial ways this plays out is through Safaricom’s extensive investment in corporate social responsibility (CSR) initiatives. Like many companies, Safaricom has a philanthropic foundation that provides goods traditionally considered the responsibility of modern states: education, health services, clean water. And it is important to note many Kenyans expect Safaricom to step in to provide services that the Kenyan state is either unwilling or unable to provide. As one Safaricom employee told us, when something terrible happens, people ask, “What is Safaricom doing” to help? Through CSR, in other words, Safaricom engages in state-like actions. Globally, CSR is now big business, but it is not always good business (Rajak 2011). Instead, it is often seen as a necessary expense stemming from relatively selfless commitments to philanthropy or an interest in managing public image. In Safaricom’s case, however, CSR and core commercial services often exist in a zone of indistinction: what qualifies as philanthropy and what qualifies as business is not always obvious. For example, their enormously successful and profitable mobile money transfer service, M-Pesa, was originally promulgated as a CSR initiative. For a contemporary development industry that sees connectivity as a human right, simply selling airtime bundles is framed as a means of securing the public good (Figure 3). For Safaricom, however, while this indistinction requires vigilant management, it is not a problem to be solved, but rather a strategic stance. It is through the work of “building communities” and “transforming lives” that new markets and new profits result (Safaricom Foundation 2014). CSR is concurrently a global corporate strategy and a means of more firmly embedding Safaricom within a particularly Kenyan milieu. However, proximity to Kenyan particularity can be a liability for the company. Although Safaricom can parlay its state-like actions into profits, it cannot predict how Kenya’s multiple publics will register their claims and critiques. 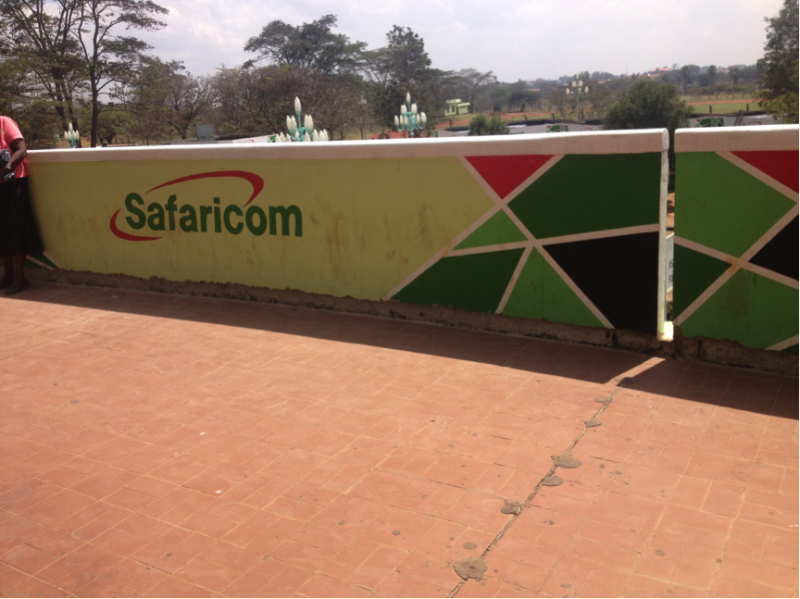 In a country where the reach of infrastructures often maps onto ethnoregional patterns of stratification, Safaricom’s role as provider of infrastructures and services—its state-like actions—are always open to accusations of engaging in ethnic politics. This happens in ways significant and mundane: the public even scrutinizes promotional giveaways for signs of ethnic favoritism, requiring Safaricom’s CEO to publicly insist on the company’s objectivity. It is Safaricom’s efforts to manage these contradictions to which we now turn. Figure 3. Safaricom Symbolism Seeks to Unite Kenya. If Safaricom’s importance in Kenya suggests the emergence of something like a corporate state, it is a stature dependent on the savvy enactment of corporate nationhood. Understood as a unifying, emotional bond, nationalism has a precarious status in Kenya. Often loyalties are more circumscribed, leading to moments of intense fragmentation along the lines of ethnicity, or what John Lonsdale (1992) calls “political tribalism.” As Safaricom seeks to don the mantle of the nation, its position is similarly fraught, but the company does much to address this. For example, other large corporations in Kenya are considered biased due to their management’s ethnic affiliation. Safaricom, in contrast, employs foreign management to avoid accusations of favoritism. In its public performances, too, it does its best to present itself as an undifferentiating national force, such as in its advertisements, which soar through landscapes of natural vitality and human productivity (Safaricom 2010, 2013). In both cases, it is through a strategy of distance from certain aspects of Kenyan business and politics that Safaricom seeks to achieve a national identity unencumbered by the ethnic politics that have characterized postcolonial Kenya. Thus, although we argue here that Safaricom relies on an intimate relationship with Kenya’s distinctiveness, that relationship is calibrated to maintain a distance from some of Kenya’s more divisive aspects. Indeed, maintaining this distance is critical to its profit-making capacities. Safaricom’s success in Kenya is widely celebrated as an emblem of “Africa rising,” an aphorism that signals an end to “the hopeless continent” (The Economist 2000), its patronage politics, and the uneven service delivery that are said to beleaguer the continent’s progress. Less noted, however, is how Safaricom’s success has been dependent on the uneasy management of the dialectics of intimacy and estrangement, of proximity and distance. It is by working these unwieldy middle grounds that new relations of power among “the public,” “the private,” and “the philanthropic” become visible. It is here that the lines between market making and the public good, enacted through infrastructure, come to the fore and change the terrain on which Kenyans can make claims for services, redistribution, and recognition. Bear, Laura, Karen Ho, Anna Tsing, and Sylvia Yanagisako. 2015. “Gens: A Feminist Manifesto for the Study of Capitalism.” Cultural Anthropology, March 30. Available at link. Bright, Jake, and Audrey Hruby. 2015. “The Rise of Silicon Savannah and Africa’s Tech Movement.” Techcrunch, July 23. Available at link. Collier, Stephen. 2011. Post-Soviet Social: Neoliberalism, Social Modernity, Biopolitics. Princeton, NJ: Princeton University Press. Lonsdale, John. 1992. “The Moral Economy of Mau Mau.” In Unhappy Valley: Conflict in Kenya and Africa, Book 2, edited by Bruce Berman and John Lonsdale, 315-468. Oxford, UK: James Currey. Holmes, Douglas, and George Marcus. 2006. “Para-ethnography and the Rise of the Symbolic Analyst.” In Frontiers of Capital: Ethnographic Reflections on the New Economy, edited by M. Fisher and G. Downey, 33–57. Durham, NC: Duke University Press. Morawczynski, Olga. 2009. “Exploring the Usage and Impact of “Transformational” Mobile Financial Services: The Case of M-PESA in Kenya.” Journal of Eastern African Studies 3(3):509–525. Ombega Mageto, J. 2009. “We Deserve Some Respect, Safaricom” [letter to the editor]. Daily Nation, July 9, 2009. Available at link. Rajak, Dinah. 2011. In Good Company: An Anatomy of Corporate Social Responsibility. Stanford, CA: Stanford University Press. Safaricom. 2010. “Niko na Safaricom,” Available at link. ———. 2013. “Niko na Safaricom,” Available at link. Safaricom Foundation. 2014. Safaricom Foundation Strategy April 2014 to March 2017: Building communities; Transforming lives. Available at pdf. The Economist. 2000. “Hopeless Africa.” The Economist, May 11. Available at link. White House. 2015. “Remarks by President Obama to the Kenyan People.” July 26. Available at link.